Last Updated: August 24, 2018 | Subscribe to our weekly newsletter! You don’t have to shell out a fortune for fancy additives to manage your pool’s unruly alkalinity level. Good ol’ muriatic acid readily does the trick. Don’t just pour some acid into your pool, though, or you’ll be doing way more harm than good. Left untreated, high alkalinity can cause damaging scale to form inside your pool and circulation system. It can drag pH up with it, and throw your water chemistry all out of whack. Adding muriatic acid is an easy, inexpensive way to lower your pool’s alkalinity. All you need is a bucket, some safety precautions, and a little patience. This chemical isn’t the kind that will make you see pink elephants flying over rainbows delivering cupcakes If only that were really a thing. But it is the kind commonly used to clean brick and lower the pH of masonry to help paint adhere better. It’s also found in the human stomach. In your body, it works to raise the pH in your gut to aid digestion and destroy microorganisms that would otherwise make you sick. 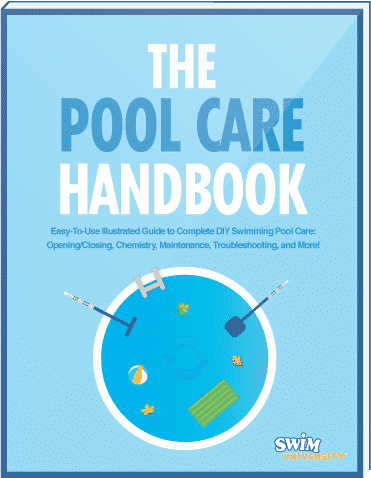 Muriatic acid balances your pool chemistry by lowering total alkalinity and pH. It typically has a lower concentration of hydrogen chloride than the muriatic acid you’ll find at hardware stores for use in industrial applications like masonry. Make sure the chemicals you use have the correct concentration of the functioning agent—that’s like the active ingredient in medicine. Achieving balanced water chemistry will be safer and easier with products formulated especially for use in pools. If your pool uses a cartridge filter, you may already have muriatic acid on hand. It’s commonly used to deep clean filters, and is especially useful in breaking down the gooey residue that can build up there. If you’ve been using muriatic acid to clean your filter If you click this link and make a purchase, we earn a commission at no additional cost to you. , you can use the same stuff to lower your pool’s alkalinity. Learning about basic pool chemistry can be overwhelming. Even for seasoned pool owners, problems sometimes crop up that leave you wondering where the heck you went wrong with your water. One of the most important things to remember about high alkalinity is, if you can afford to wait, it will decrease over time on its own. But high total alkalinity is problematic for a couple of reasons including algae, which can quickly become a problem when your pool has high alkalinity, so it’s often worth addressing with chemicals. When your pool’s pH is high, the water is called basic, meaning it lacks the right balance of acidity. When this happens, the water becomes soft, flaky, and prone to calcium buildup. Scaling and flakes due to high pH or alkalinity can clog your circulation system and filter. Your sanitizer will have to work harder, leading you to add more chlorine. You may even start to notice your pH levels rising over time when the total alkalinity is high. High pH can lead to high calcium hardness and high alkalinity. Because pH is naturally unstable, it needs a buffer to help it stay in optimal range. That’s what alkalinity does. It helps prevent pH from changing too much, too fast. When you lower alkalinity, you’ll also be lowering pH. The chemicals used to reduce one, work on both naturally, but pH tends to be more intensely affected than alkalinity. In order to avoid creating a pendulum effect with your pH levels when you lower alkalinity, bring your pH down just below the ideal seven parts per million (ppm). To limit drastic changes, adjust the pH in stages, adding chemicals and retesting the next day, as many times as needed. This approach lets you nudge total alkalinity in the right direction, rather than shoving it off a cliff. Keeping your pool’s alkalinity in check helps keep pH in check, which helps your sanitizer do its best and prevents buildup and contaminants from taking over your pool. Although they tend to affect each other in the same direction, you’ll sometimes end up with low pH and high alkalinity. Usually, this issue pops up when you add too much cyanuric acid to your pool. Using a chlorine stabilizer in your outdoor pool is important, but using it incorrectly will negatively affect your overall water chemistry. You may also notice a weird imbalance because alkalinity and pH are affected by chemicals at different rates, so even when you make adjustments, one may rise more than the other. 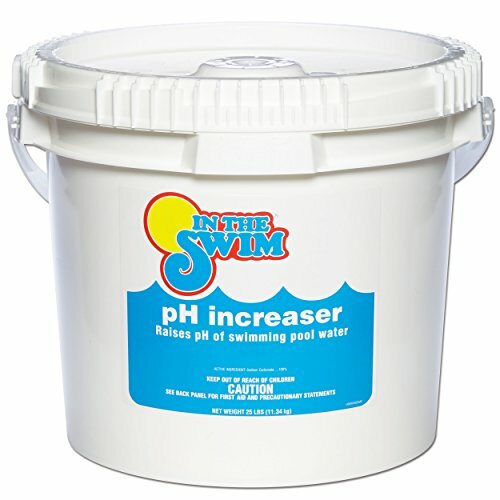 Pool supply stores carry a product called pH Decreaser, which is mostly Sodium Bisulphate. This product will lower both pH and total alkalinity, but you can use muriatic acid If you click this link and make a purchase, we earn a commission at no additional cost to you. instead. Because you may already have it on hand, and it’s cheaper than pH Decreaser, it’s worth knowing the right way to use muriatic acid to lower your pool’s alkalinity. Before you start mixing up chemicals, you need to get your mad scientist gear on. Muriatic acid is extremely caustic. It can burn your skin in seconds, and the vapor from muriatic acid can cause serious respiratory problems. You’ll need a few things to keep yourself protected when using it. 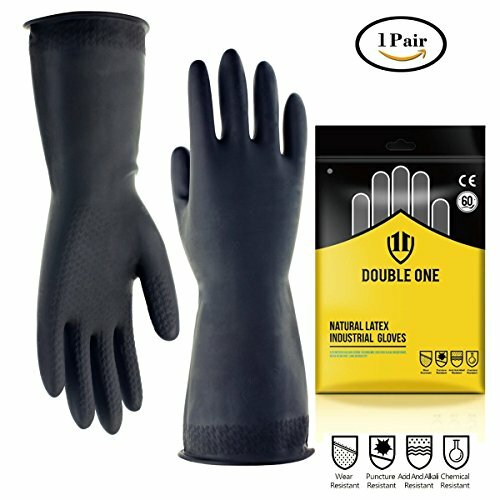 Chemical resistant gloves If you click this link and make a purchase, we earn a commission at no additional cost to you. Chemical resistant apron If you click this link and make a purchase, we earn a commission at no additional cost to you. Wooden or plastic stirrer If you click this link and make a purchase, we earn a commission at no additional cost to you. 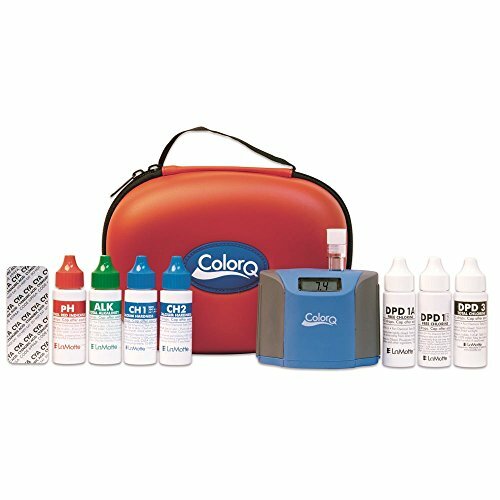 Before you add anything, you need an accurate measurement of pH and total alkalinity in your pool. Test strips If you click this link and make a purchase, we earn a commission at no additional cost to you. work pretty well, but digital test kits If you click this link and make a purchase, we earn a commission at no additional cost to you. are even more precise. No matter the reading, lowering your pool’s alkalinity with muriatic acid is best done in stages, which can be time consuming. First, you’ll need to know how many gallons of water your pool holds as well as the pH and alkalinity levels. If you’re lowering your pool’s alkalinity and pH, you can calculate how much muriatic acid to add so your pH is just below optimal range. This will bring your alkalinity down to normal, then you can run the pump to aerate your pool and gently nudge the pH upward. The label on your muriatic acid should help you determine how much to add, but if it doesn’t, you can plug your figures into an online calculator. If you need to significantly lower your alkalinity while trying to keep your pH as stable as possible, shut off your pump before adding muriatic acid. When the pump is on, it helps circulate chemicals, but also adds oxygen through churning and bubbling the water. This exposure to oxygen significantly amplifies the effects of muriatic acid on pH. When you want to lower total alkalinity by a wide margin, minimize water movement by turning off the pump and any water features you have. 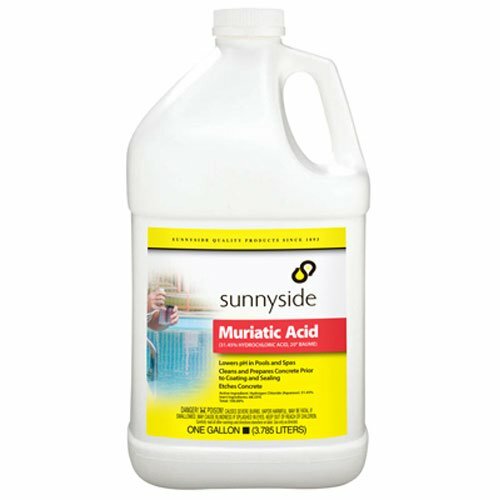 If you were in a hurry, you could pour muriatic acid straight into your pool water, but diluting it first makes it easier to handle and less dangerous to you if it splashes. It’s worth a few extra minutes and a bucket If you click this link and make a purchase, we earn a commission at no additional cost to you. to water it down. The ideal ratio of water to muriatic acid is 10:1. Pour the appropriate amount of acid into the water, then stir it gently with a plastic or wooden stir stick. Important: Add water to your bucket first. If you add the acid first, you run the risk of a chemical reaction. Pour the contents of the bucket into the deep end of your pool. If your pH is also high, you can walk around the pool slowly pouring the mixture in as you go. This helps add a little air to the water and gets the chemical circulating as you add it. Warning: Rinse your muriatic acid bucket thoroughly after every use, and do not use it for any other chemicals. You could cause an actual explosion. You can take one of two approaches here. Play it safe and kick your pump on to circulate the muriatic acid for at least half an hour. This will help prevent the acid from settling on the bottom of your pool and doing damage to your pool surfaces. Or, you can leave your pump off and let the acid work on your alkalinity. This approach is called pooling. (Catchy, right?) The problem is that muriatic acid is extremely caustic and will eat into your pool floor if you leave it to settle. You’ll need to constantly brush the pool floor to prevent the acid from doing damage. The difference between these methods on lowering alkalinity without hitting pH is a matter of opinion. The effect of muriatic acid on pool surfaces, however, is hard fact. If you want to be sure you won’t accidentally damage your pool, turn your pump back on for half an hour immediately after adding the muriatic acid. If you need to bring your pH back up a little, you can continue running your pump to aerate the water. Adding air helps prevent the yo-yo effect you can wind up with when you try to chemically increase pH back up and wind up raising alkalinity as well. The easiest way to manage this is to turn your return jets upward and put your pump on its highest setting. Turn on any water features you have as well. 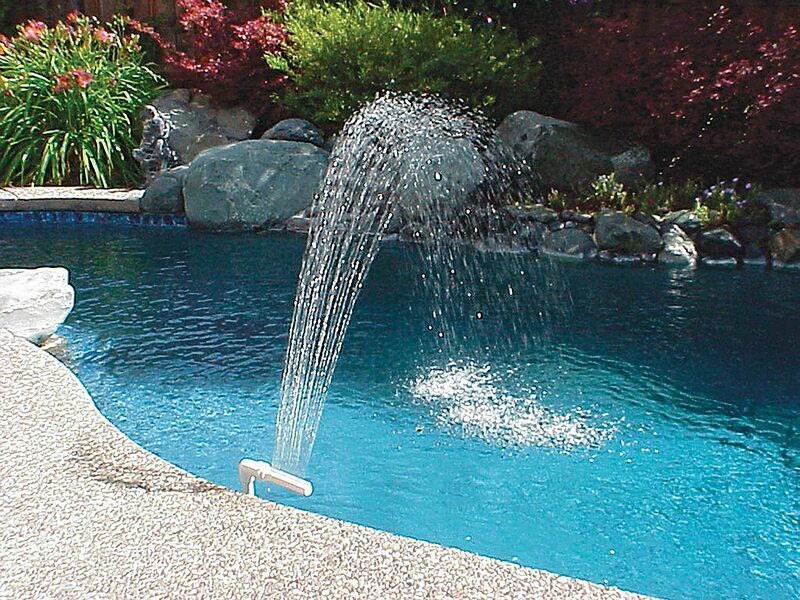 You could even take more drastic measures if you like, such as adding an aerator or a fountain If you click this link and make a purchase, we earn a commission at no additional cost to you. , which accomplishes the same goal. The morning after you add muriatic acid If you click this link and make a purchase, we earn a commission at no additional cost to you. to your pool, recheck the water chemistry. If your alkalinity hasn’t gone down far enough, you can add another dose of muriatic acid. If your pH went too low, but your alkalinity is good, keep aerating your pool. Check pH again in another day to see if it’s increased. If the pH still needs to be increased significantly, you may need to use a chemical pH increaser If you click this link and make a purchase, we earn a commission at no additional cost to you. . Just be sure to use a light touch. Test and add muriatic acid in small doses, repeating as many times as necessary to get the alkalinity back down. It’s not unusual for it to take a couple doses, but if you can’t seem to get your pH and alkalinity under control, take your water to your trusted pool store for testing. Your problem could be one of testing accuracy, not actual chemistry. You can prevent staining, corrosion, algae blooms, and even the spread of recreational water illnesses, such as norovirus (also known as the dreaded stomach bug). All you need to do is create a schedule to regularly check and balance your pool’s water chemistry. Increase the frequency of checks and add sanitizer more often when you have more people using your pool. When you properly manage your pool chemistry, you’ll reduce the need for adjusting your alkalinity in the first place. But if things get out of whack, just remember a little muriatic acid added with care and caution can help you get things back on track, and help you get back to enjoying your pool.